Bayern Munich head coach Pep Guardiola praised his players for an utterly dominant performance after thrashing Shakhtar Donetsk 7-0 in their Champions League last-16 second leg. The German champions were expected to be given a tricky test by the Ukrainians after a hard fought goalless draw in the first leg but instead made light work of their opponents. Bayern were handed the advantage when Oleksandr Kucher was sent off after three minutes, the quickest sending off in the history of the Champions League. Thomas Muller converted the resulting penalty and it was one-way traffic after that, Muller grabbing a second after half time while Jerome Boateng, Franck Ribery, Holger Badstuber, Robert Lewandowski and Mario Gotze also got on the scoresheet. Guardiola says the Bavarians always expected to get through and was proud of the performance his team produced on their way to the last-eight. "Of course we are satisfied. It was a clear result. It was a little easier as we were playing 11 against ten for a long time. 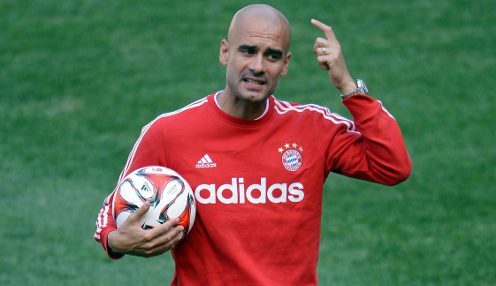 Shakhtar didn't have one really good chance," said Guardiola. “Congratulations to my team. We will play in the quarter-finals, that is what we expected and what we wanted. "It was the first time in my coaching career that we played with five forwards. In the first leg we had lots of problems with their defence, so today I decided to play with [Franck] Ribéry and [Arjen] Robben in the middle and [Robert] Lewandowski and [Thomas] Müller. We were dominating the game. "Shakhtar have really great quality, especially in attack, I knew that. But of course it became a little bit easier when we had an extra player." Bayern are now 1/1 to win the Champions League, with last year's winners Real Madrid 1/1 and Paris Saint-Germain 1/1. The only dampener on Bayern's great night came when both Franck Ribery and Arjen Robben limped out of the action, Robben lasting just 19 minutes before reporting a thigh injury. Meanwhile, Ribery went off after an hour with an ankle but Guardiola is hopeful neither picked up a serious problem. "We have to see tomorrow what the damage is but doctors said it is not too serious for them," Guardiola added. It remains to be seen whether the duo will feature in Saturday's game with Werder Breman, a match Bayern are 1/1 to win. The home side are 1/1 and the draw 1/1.